Com as nossas ideias de Voo + Hotel para Salamanca poderá descansar na horta que inspirou o final de La Celestina; encontrar alguma joia da literatura numa livraria histórica; passar uma noite divertida na sua conhecida rua cheia de bares; ou subir às torres de uma das poucas cidades espanholas com duas catedrais. Salamanca is an architectural tapestry woven in sandstone. Though there are excellent examples of Roman, Romanesque, Gothic, Renaissance and baroque structures, the golden stone itself is the thread of continuity and harmony. Nonetheless, this ancient university town, has many monumental highlights. Plaza Mayor, considered by many the most beautiful main square in Spain is a fine place for admiring architecture. The town hall is the large, elegant building in the centre of the square. Two beautiful cathedrals stand side by side: the New Cathedral boasts beautiful Plateresque facades and it is the only entrance to the connecting old, Romanesque Catedral Vieja. The university, the focal point of the city, is one of the best examples of Spanish Plateresque style. Salamanca at night is a party. 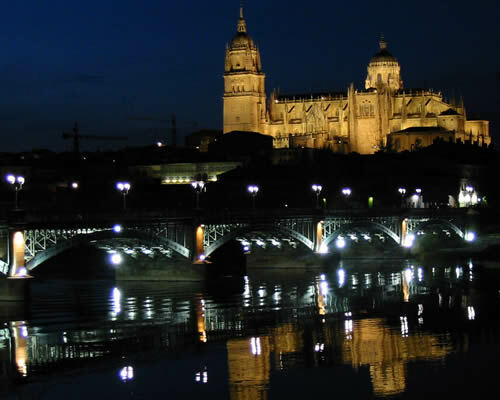 The illuminated city is the meeting point for hundreds of students collecting tapas and beer. 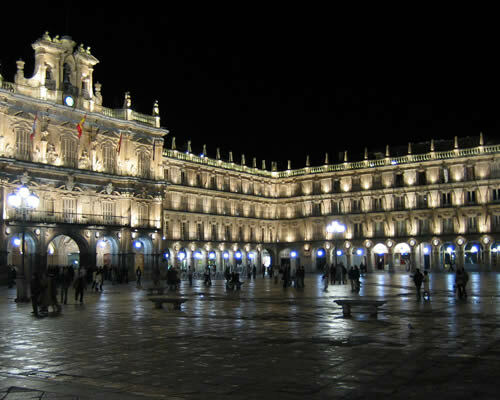 But make no mistake, it is also a city to enjoy a quiet night, savoring some wine on a terrace of Plaza Mayor.